I hope you’re enjoying Sunday! 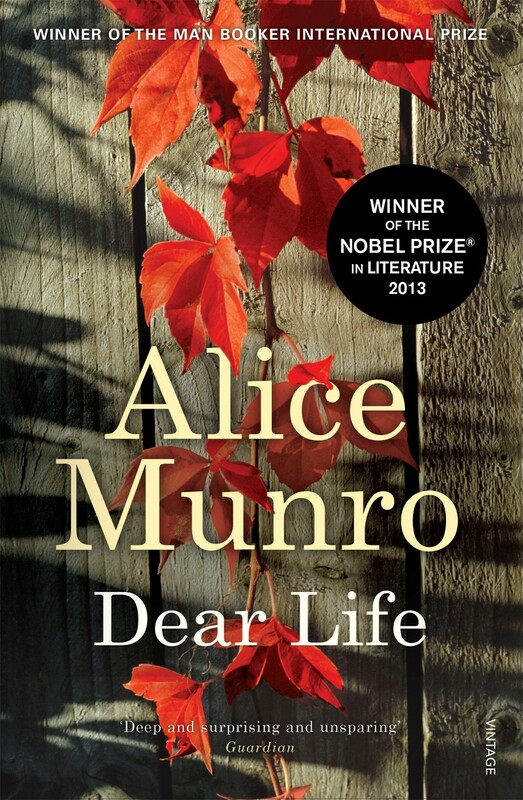 Today I’ve got a review of Alice Munro’s short story collection Dear Life for you. Alice Munro won the Nobel Prize in Literature in 2013 and this is the first time I’ve read something she has written. I have to thank Random House UK for this copy. I got it to discuss it with other readers on Lovelybooks and to write a review. Dear Life is divided into two parts. The first one consists of ten short stories, the second of four autobiographical pieces. I’ll only review the short stories. As far as I can remember, all of them are set in Canada, many in the 20th century. Of course, Alice Munro knows her trade. She understands how to set the scene and how to transfer atmosphere. In Dear Life, Alice Munro’s characters often seem to share similarities. The oppressed woman, the confused man and sometimes a child to tell us all about their problems. What struck me most, was how Mrs. Munro told stories from a child’s perspective. Especially in “Gravel”. You really think you are a child experiencing what the narrator experienced. Unfortunately, technique isn’t everything. Don’t get me wrong, “To Reach Japan” was perfect! I also enjoyed “Amundsen” and “In Sight Of The Lake”. But the remaining seven short stories didn’t do the trick. They were okay, but I really expected more than just “okay”. While “To Reach Japan” was captivating and left me thinking, “Dolly” for example, left me indifferent. As Alice Munro has won the Nobel Prize, I’m sure there are better short story collections out there. If life is like it is shown in Dear Life, it’s mostly dull, gray and tedious.